Hampshire Mezzanine have been back to Hampshire Flag Company to fit a new racking system on the mezzanine floor fitted last year. The Hampshire Flag company wanted a way of utilising the dead space located above pallets on the mezzanine floor and also to enable selectivity of items stored here. HMF fitted a Dexion p90 pallet racking system complete with steel decking panels to the racking. This allowed Hampshire Flag total flexibility to re-site the beam/shelf levels to suit the product being stored in the future. Within each bay of racking, two number 1200 × 1000mm pallets were located using a hand pallet truck on the mezzanine. 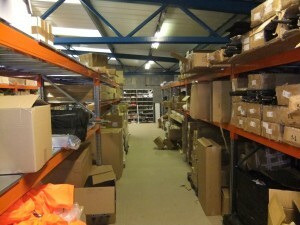 Above these two pallets, the additional two storage levels were then located. 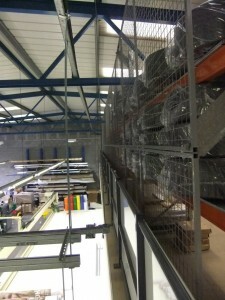 One run of racking on the edge of the mezzanine was fitted with anti-collapse mesh partition complete with stand-off brackets to enable this mesh screen to be positioned 150mm behind the rear of the racking so that the bottom level pallets could sit flush with the front of the racking. For additional safety Hampshire Mezzanine Floors fitted this single rack into the steelwork of the mezzanine and also extended the rear upright of the racking one metre higher with additional bracing to enable the anti-collapse mesh to extend up well above the top shelf to ensure items being stored on this top level could not accidentally dislodged over the edge of the mezzanine. Hampshire Mezzanine Floors are Dexion’s main distributor for Hampshire and Dorset and supplies their complete range of shelving, longspan and pallet racking systems. HMF have been a main Dexion storage centre for 26 years.